But it’s here now, and it’s pricey. 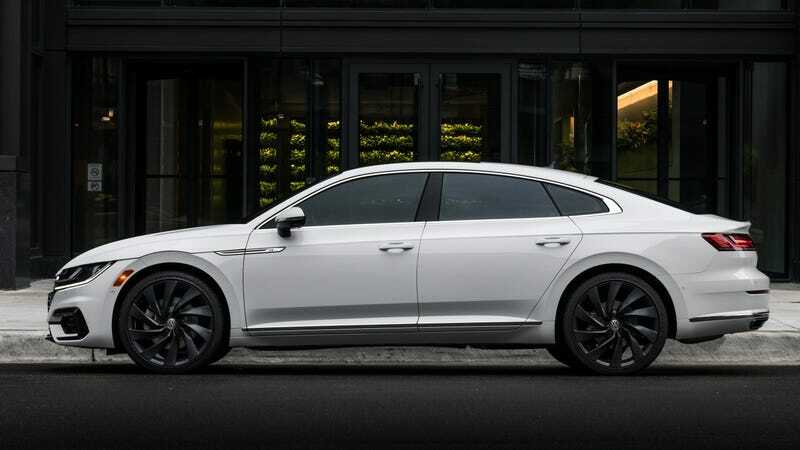 Volkswagen announced Thursday that the 2019 Arteon will be at U.S. dealers in April, starting at $35,845 for front-wheel drive and $37,645 for all-wheel drive. Destination fees are $995. The Arteon, Volkswagen’s replacement for the CC (likely referred to as the “Huh?” by most people you know), is new in the company’s American lineup. It’ll be the third and most expensive sedan Volkswagen offers here, above both the Jetta, which starts at $18,745, and the Passat, which starts at $25,295. It’s also been a long time in the making, since the word two years ago was that the Arteon would be here for 2018. That didn’t happen, with Volkswagen blaming new European emissions certifications tests for its delay onto the U.S. market, and the Arteon’s model year clicked up one digit to 2019. It’s not like the year delay was a huge deal, though, considering that buyers aren’t exactly obsessing over the arrival of new sedans these days. All three trims of the 2019 Arteon—the SE, SEL and SEL Premium—will get a 2.0-liter turbocharged four-cylinder engine that makes a rated 268 horsepower and 258 lb-ft of torque, which will send power to either some or all of the wheels through a standard eight-speed automatic transmission. An adaptive damping suspension system, start-stop and LED headlights will be standard on each trim, along with the ability to use Apple CarPlay , Android Auto and certain driver-assistance features. The middle SEL trim, on top of that, will get wood-look accents, remote start, a digital cockpit display, a panoramic sunroof and other additions for $39,995 on the FWD model and $41,795 for AWD. The top SEL Premium, which starts at $44,945, has standard AWD and 19-inch wheels. It gets a heated steering wheel, ventilated front seats, paddle shifters, seat massagers for the driver, heated rear seats and a power trunk. It’s fancy, basically, and its price reflects that—the Arteon in upper trims very much wants to be a luxury sedan, it seems. Every trim also has the option to add Volkswagen’s “performance-inspired” R-Line package with “sporty exterior and interior design treatments,” if you feel like looking sporty. It’s only $1,265 extra for the R-Line package with 19-inch wheels and $1,765 for the one with 20-inch wheels—a low, low price to put on looking the part. After all, it’s kind of like those knockoff designer accessories that caught your eye on that sketchy website once and took so long to arrive that you forgot you ordered them at all. If the Arteon’s going to take this long to get here, it might as well look as good as it possibly can.